Will this $69b merger help the little guy? Don’t count it. 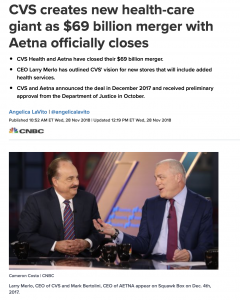 In the increasing consolidation, mergers, and big take-overs, this CVS/Aetna one is arguably going to affect small businesses owners more than any other in recent memory. This one gives a vertically integrated internal pharmacy benefit monopolistic control of any Aetna policy holder’s pharmacy benefit. What’s that mean? It literally gives Aetna/CVS total control over the premium used to pay for pharmacy benefits. The pharmacy benefit manager and discount mail order retailer Caremart is now a subsidiary of CVS. So now there is stranglehold that creates less choices for the consumer. On the one hand, more than ever, they are able to arrange rebates and discounts are retained by the carrier through a “bundled” plan. Those rebates and discounts are then passed onto the policyholder … just kidding. Corporate executives and shareholders will get fatter checks; Anyone doing business with Aetna, particularly small business owners, will see the continuation of rising pharmacy prices. Consolidation and bundling increases costs by narrowing competition and alternatives. We have found that unbundling these “plans” that are unwieldy and unnecessarily expensive for company owners is a viable solution. He told me that the cost using insurance and their PBM was $1,200 a month. He then told me that the cash price for the same drug at an independent pharmacy was $180. 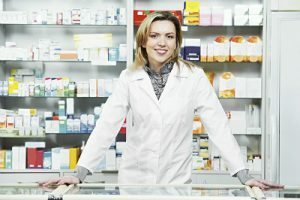 Let’s set up a plan with your local independent pharmacist. Just this week, I received a call from one of our clients who had to fill a prescription for a drug called Acccutane – an expensive acne medication. He told me that the cost using insurance and their Pharmacy Benefit Manager (PBM) was $1,200 a month. He then told me that the cash price for the same drug at an independent pharmacy was $180. Now what makes more sense: Going to the Aetna/CVS/Caremark of the world for this type of unaccountable, blind, inflated pricing, hiding behind copays and premiums … or working directly with your local independent pharmacy professionals which what ECCHIC advocates? This article on the completion of the merger indicated that the company hopes to “book saving of more than $750 million.” Now who do you think will realize that benefit – you or stock holders? Let’s bypass all this and let’s put control of your plan back in your hands.